As a well-respected cosmetic dental office in Scottsdale, we receive many questions about general and cosmetic dentistry. For your convenience, we have compiled a list of some of our most frequently asked questions. We welcome any comments or questions you may have and look forward to assisting you in all of your dental goals. Will my smile look fake after dental veneers or tooth whitening? How long will dental veneers for my front teeth last? I would like to remove all the metal in my back teeth but I don’t want my teeth cut down for caps or crowns. Why can’t I just wait until my teeth break or hurt, and then I have them fixed? What’s the difference between a regular cap or crown and metal-free restorations? How can I make my smile look its absolute best? How long does it take to improve my smile? How do I take care of these metal free teeth so they will last forever? How can I get tooth whitening done for the least cost? OK, I’m ready to improve my smile and appearance, but how am I going to be sure that I will like what I get? Will I be comfortable throughout treatment? How can I afford services like dental veneers and tooth whitening? Will You Give me an Estimate of my Treatment Cost? The experience of most people is that they recollect seeing people in person or on TV who have had all their teeth “fixed” to improve their appearance. This is usually back in the 1980s and earlier. Before the 1990s most cosmetic dental work for the front teeth involved using porcelain-metal crowns or caps. These created the appearance of flat, opaque, refrigerator-white fake or denture type teeth. Not only that, many times there were dark lines at the gum line [metal margins], and the gums looked red. Since the early 1990s, we have had technology that allows us to restore front teeth with metal-free ceramic dental veneers. There are no dark lines at the roots and the Veneers are translucent like natural teeth. Also, dental veneers do not irritate the gums, so they do not turn red. In almost all cases, this kind of dental work is undetectable. Once your teeth are reinforced with all-ceramic dental veneers, they now are very similar in wear resistance to natural teeth. Teeth tend to get worn down most at night when we are asleep. At this time we may tend to clench or grind our teeth. In general, food does not wear down our teeth. So, for people who may clench or grind at night, the answer to protecting dental veneers is the same as protecting natural teeth; wear a Night-Guard. Another aspect to this question concerns food types we ingest. As with natural teeth, we need to greatly reduce our intake of refined carbohydrates or sugars. This is especially true in terms of sugar in coffee or tea, soft drinks, gum and hard candy. We can additionally supplement with topical prescription strength fluoride gel to help reduce the incidence of new decay. It is totally realistic to expect natural teeth and those with dental veneers to last for years or even decades. I would like to remove all the metal in my back teeth, but I don’t want my teeth cut down for caps or crowns. When we remove all the metal in back teeth we remove the metal, all the underlying decay and evident fractures. All healthy natural tooth structure is left intact. It is not cut out. We take an impression of the defects and our laboratory makes ceramic replacements. These are then fused to the remaining natural tooth structure with adhesives. These teeth are now as strong as natural teeth (sometimes stronger) and were restored in the most conservative manner. Yes, you could. And many people do this. But, once teeth begin to fail, or have fractured, many times the subsequent dental work is more extensive and expensive than if these same teeth were restored and reinforced earlier. In restoring these teeth earlier, we can avoid future root canal therapy, extraction, surgery, and bridges. The savings in money, time, and aggravation can be enormous. What’s the difference between a regular cap or crown, and these metal-free restorations? The difference is like night and day. The technologies are completely different. The method of their fabrication is completely different. First of all, traditional metal or porcelain-metal caps or crowns have all-metal undersides. This technology began in the early 1900s. Cements have to be used to fill the space between the metal and the tooth. The porcelain is placed over the metal to hide the dark metal. This is very difficult to do well, and many porcelain-metal crowns still look fake no matter how well they are made. And metal or gold crowns look like gold crowns. The metal free restorations are usually prepared as inlays, onlays, and sometimes as crowns when needed. Inlays and onlays are much more conservative. Secondly, the metal-free components are made of all-ceramic, composite polymers, or fiber reinforced polymer. These are then fused, or bonded to the natural part of the teeth with resin cements that polymerize and seal the space between the restoration and the tooth. This seal is better than the seal between metal and teeth with traditional cements. The subsequent result is teeth that look like natural translucent teeth. Very much like your own. If your teeth already look balanced and symmetrical, but are too yellow, brown, gray, or stained, then the best solution is teeth whitening. In two to four weeks teeth whitening can completely change your look. On the other hand, if your front teeth are a little too short, spaced unevenly, chipped, cracked, stained, filled with all kinds of fillings, or your teeth genetic make-up was just not as good as the rest of your genetic make-up, then using dental veneers will definitely give you the best end result. If there are just isolated problems, but the rest of your teeth look great, then direct resin composite can easily correct this. Sometimes, we will bleach all the teeth, and then use dental veneers or composite resin to improve localized areas, and match the new, whiter shade. There are an unlimited number of combinations of services to help attain a spectacular look, and dental veneers and tooth whitening can give our Arizona patients a complete smile makeover. In more difficult cases, using all ceramic dental veneers usually takes three to four weeks (including laboratory time) from start to finish. This includes two appointments; the first appointment for dental veneers will be several hours long, and the second appointment will be half as long. When using direct resin composite, we can finish all work in one visit. How do I take care of these metal-free teeth, so they will last forever? You can get many, many years of mileage out of your newly restored teeth by wearing a Night Guard at night, eliminating refined sugar in your diet, using a prescription fluoride gel daily, and seeing a hygienist on a regular basis. If you do so, it is possible you will not have to see a dentist for a very long time. Tooth whitening can be accomplished in the office in one hour or at home in two to four weeks. The best results are achieved using tooth whitening systems that allow you to bleach at home. This way you have full control over the outcome. That’s simple. 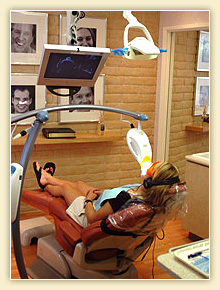 We have been enhancing smiles for many years. We have found that the more control we can give up to our clients, the better the expected result. Initially, we use a series of before/after photos to narrow down the variables concerning an individual’s case. We then use digital imaging and software to produce an approximation of what the final result may look like, whether you opt for tooth whitening, dental veneers, or another treatment. You will see a before photo and an after photo before any work is begun. Finally, we can do a cosmetic mock-up directly on your teeth. This takes an hour or so, but then you can see exactly how you will look with your new smile. It is here where we can make any needed changes, so that you are completely satisfied. Once you give the OK, then we will make replicas of this cosmetic mock-up so our laboratory will know exactly what you expect. All I ever hear are horror stories about people’s experiences at dental offices (i.e. : Dustin Hoffman in Marathon Man). Well, there is no excuse for experiencing any discomfort when dental veneers, tooth whitening, or other services are provided at our office. Sedation dentistry, anesthetics, and methods of delivery make pain control easy. Additionally, pre-medication with a muscle relaxant, and watching a movie, cable television, or listening to a CD or FM station can help time pass uneventfully. Our team can provide the support needed to make your experience civilized and comfortable. We have made arrangements with multiple banks and finance companies that specifically work with healthcare professionals and clients. Interest rates can range from zero to less than most credit cards. We will help you review all available arrangements, including insurance questions. We appreciate the emotional and financial investment required to proceed with comprehensive dentistry. We strive to give you an accurate estimate of the total investment for the recommended treatment. Occasionally additional treatment may be recommended based on a change in your dental condition or for other unforeseen factors. If additional treatment is necessary we will inform you at the time it becomes apparent so that you make an appropriate decision. For your convenience we accept Cash, Checks, Visa®, Master Card®, Discover®, and American Express. If you wish you may use your ATM card, as well. We also offer long-term dental financing options through CareCredit™ and Capital One® Financing. If you have any more questions or concerns, or you would like to schedule an appointment with our dentists, please contact Scottsdale Smile Center today.